PM Netanyahu responds to Sweden's announcement it would recognize "Palestine", says unilateral moves will not bring peace. 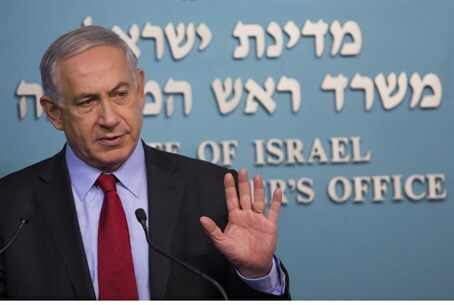 Netanyahu clarified that unilateral actions will only reduce the chances of reaching a peace agreement with the Palestinian Authority (PA). Sweden’s announcement on Saturday raised the ire of Israel and the United States, and Israel said it would summon Sweden's ambassador to Israel over the move. On Sunday, however, Sweden effectively retracted the statement from Saturday. "The prime minister said that the conflict between Israel and Palestine can be solved through the two-state solution, by negotiations in accordance with the principles of international law,” the Swedish Embassy in Israel said in a statement. The solution “must guarantee the legitimate demands of both Palestinians and Israelis, to self-determination and security. The two-state solution requires mutual recognition and the will to live together in peace. The prime minister summed up by saying that as a result, Sweden would recognize the Palestinian state,” the statement added.